Most of the action across the globe this weekend took place on Saturday, but there was one important result occurring on Friday. For that, we head to Salle Calypso in Calais, France where the European super featherweight title changed hands for the first time since 2012. Reigning champion Devis Boschiero, 34-2-1 (16), was putting his belt at risk for the fourth occasion, but the first time outside his native Italy, specifically in the hometown of challenger Romain Jacob, 21-0 (7). Jacob had previously held the French title and the IBF Youth crown but on Friday, his local status was to be his key advantage in the contest. 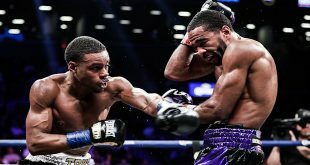 The greater experience of Boschiero, who had lost a WBC title bid by controversial decision in 2011, showed over the first half of the bout but the Frenchman had more energy in the bout's second half, swaying the judges, who awarded him the split decision with scores of 115-113, 115-113, 113-115 after 12 rounds. Team Boschiero could protest the outcome but their man is still ranked in the top three of each major sanctioning body and will likely see another world title opportunity before the end of the year. Heading across the English Channel on Saturday, British heavyweight Dereck Chisora, 20-4 (13), outworked American visitor Kevin Johnson, 29-5-1 (14), over 12 rounds at Copper Box Arena in London for an uneventful 118-110, 118-109, 118-109 points verdict in defense of the WBA and WBO International belts. On the undercard, former British, Commonwealth and Irish heavyweight champion Tyson Fury took a few hard shots from American slugger Joey Abell, 29-8 (28), before dropping him four times enroute to halting the southpaw at 1:48 of the fourth round. Fury and Chisora are reportedly looking next at a rematch, reprising their 2011 clash, won by Fury via a wide points decision. Heading across the Irish Sea, we land at Dublin's National Stadium, where France's former WBA and WBO Interim middleweight champion Hassan N'Dam N'Jikam, 29-1 (18), stayed busy by finishing off Argentina's Ricardo Marcelo Ramallo, 15-5-1 (11), over four rounds at super middle. 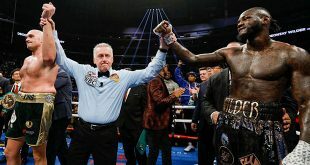 N'Jikam came off the canvas six times to hear the final bell in a failed attempt to lift the WBO middleweight title from Peter Quillin in 2012 and should soon be in a position to once again challenge for world honors. 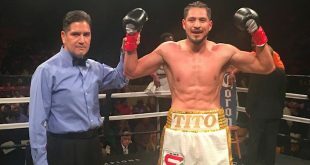 Crossing the Atlantic to Mexico, one of the top lighter weight fighters in the world was back in action in a non-title bout. Nicaragua's undefeated ex-WBA light fly and minimumweight champion Roman Gonzalez, 38-0 (32), continued his campaign as a flyweight by halting Juan Kantun, 21-6-3 (15), at 1:01 of the sixth round. The masterful Gonzalez could see an opportunity against either "regular" WBA champion Juan Carlos Reveco or WBA "super" champion Juan Francisco Estrada.